will become an appointed (or self appointed) committee. With the latest resignation of Gwen Bruns there is now a second vacancy on the School Committee. Interested parties should see notice on the Longmeadow Community Bulletin Board. There were three uncontested races for School Committee seats (Fitzgerald, Clark and Flynn) at the recent June annual town elections. Now with the two vacancies opening up, a total of 5 seats out of 7 will be either appointed (or self appointed) positions. 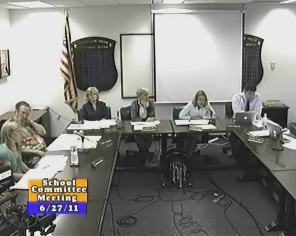 The School Committee directs the expenditure of over 30 million dollars of taxpayer monies. The upcoming SC appointments by the Select Board/SC are of great importance to our town. At this point there are 6 individuals asking to be appointed for the first vacancy. Owen J. Humphries, 1072 Longmeadow St.
Daniel Zwirko, 58 Shady Side Dr.
Why didn't you run for one of three SC vacancies at the Annual Town Elections in June? Let's hope that the SC/SB make some good selections- voters will not be able to do so until next June! Select Board member Rob Aseltine provided the best "quote of the week" during the August 15 Select Board meeting. "a situation like this drives a stake through the heart of volunteerism in this town".